The majestic Mabogabog Falls are situated right at the centre of the Patapat Viaduct. The water is channeled to power the Agua Grande Mini Hydro Power Plant before cascading to the sea. Its common to see many vehicles stopped to take photos and just listen and watch the water flowing, it’s very hypnotic! Why not stop and enjoy the noise. Countless people proclaim that pagudpud is the Boracay of the North, We would respectfully disagree and say that it is Boracay as it formerly was! And that's why it's so popular. It is Boracay as it was 25 years ago! 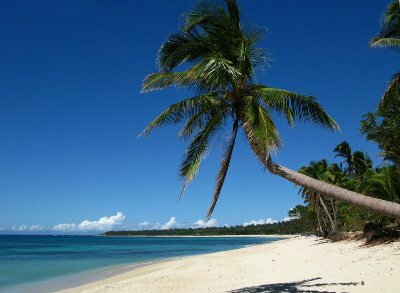 The natural white sands of Saud Beach are located at Pagudpud, just a 3 minute walk from Tartaruga's Hotel. The drowsy rural coastal area of Pagudpud is situated on the most Northern tip of Luzon, and that is about 50 miles (85 kms)up the sea-coast from Laoag City, the capital of Ilocos Norte province. The community is located to the north of Bangui and its now famous windmills and inland lies the monumental Cordillera Mountain Range, the largest mountain range in the Philippines. A distance over the other side of the mountain range lies the province of Cagayan. To the North and the West are the balmy and azure waters of the South China Sea. A great many foreign tourists are these days becoming greatly interested and recently one of Australia's most respected and important international travel writers graded Saud Beach as Number 1 on the list of the Top Ten best Asian Beaches. Find Pagudpud before the tourists find out. A great many choose to enjoy the comforts of Tartaruga's boutique hotel. The local area comprises genuinely wonderful and almost abandoned beaches, outstanding waterfalls, stunning scenic vistas, and a real authentic get away from the rat race feeling. It is no great wonder that so many feature movies and television commercials along with fashion photo shoots are filmed there. Can you really imagine a beach without too many tourists, no noisy jet skis, no strip of bars and not even a McDonalds restaurant! Come here and find out that its true! Pagudpud is located amongst lush emerald mountains, luxuriant valleys, rolling hills and flat coastal plains. The 20,000 citizens who reside in Pagudpud and the surrounding region subsist on rice farming, common agriculture, fishing, and the fresh fish and lobsters are delicious and economical here and more latterly tourism is growing. Because Pagudpud is so uncommercialized there are limited places to stay and you need to book well ahead. Choose to stay at Tartaruga's Hotel right near the beach.